Shapiro Plastic Surgery and Skin Klinic received a very special thank you from one of our patients that we would like to share with you. 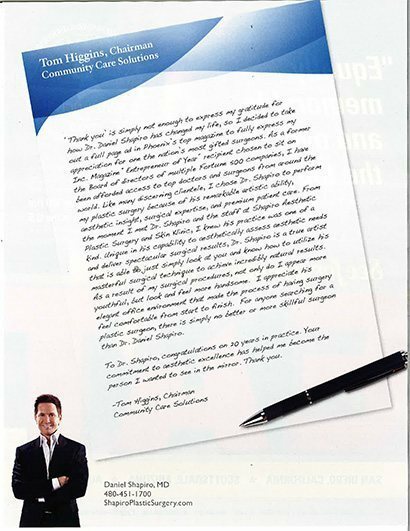 Mr. Thomas Higgins took out a full page ad in the June 2013 issue of PHOENIX magazine to express his appreciation for Dr. Shapiro and how his physical transformation has changed his life. We were surprised by this amazingly thoughtful gesture and wanted to share it with everyone here. Thank you Mr. Higgins for your kind words!